Sapphire is a variety of the mineral corundum that occurs in spectacular colors with great durability and stability. When corundum is red, it is termed a ruby. All other colors, including pink, are referred to as sapphire. Usually, when one thinks of the color of a sapphire, blue comes to mind. Fine blues remain the most valuable and desirable members of the sapphire family. Certain varieties of sapphires have phenomenal characteristics. Asterism in sapphires, caused by oriented inclusions of rutile, can produce wondrous six or twelve rayed stars. Some sapphires exhibit a color change from blue to purple or like alexandrite, from red to green. Sapphires have been found in alluvial deposits in Ceylon for generations. Locations in India and Burma have produced the most famous examples of sapphires. The Zanskar Range of the Himalayas in Kashmir is known for magnificent specimens. In recent times, lovely examples have been found in the Helena area of Montana. 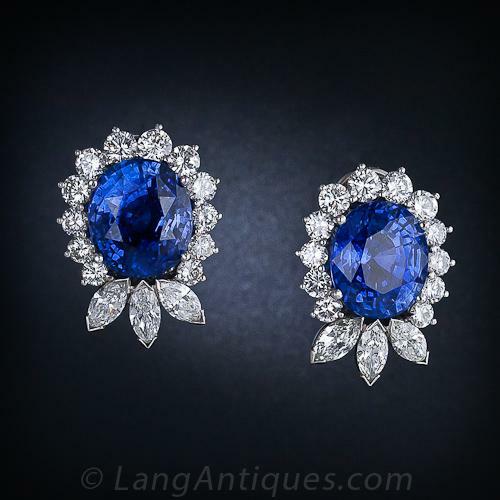 Sapphires have been routinely heat treated for decades, perhaps centuries. Heat treatment "dissolves" the silk-like inclusions in sapphires, usually resulting in a more transparent and intensely colored stone. The changes produced by heating the gems are stable. The history of the sapphire, dates back to the Etruscans in the 7th Century BC. Marco Polo's travels in the 13th Century took him to the Island of Serendid (Sri Lanka), where he describes sapphires in abundant detail in his "Book of Marvels". Sapphire became a favorite gem in rings and brooches for Medieval Kings. They believed that the sapphire would protect them from harm and envy. By the time of the Renaissance, sapphires were coveted by the wealthy and influential. Sapphires were credited with the ability of preventing poverty, making an irritable man good-tempered and a stupid man wise. Sapphire is the birthstone for September and the gem for Libra. It commemorates the 5th and 45th anniversary and is the sacred gem for Thursday. Sapphire is a gem that fosters creative expression, intuition, meditation, and mental clarity. It is considered an antidote for depression. Crystal mystics use it as a physical aid in reducing fevers and inflammation, hearing problems, cancer, and burns. Sapphire is associated with the throat and brow chakra. Fancy colors of sapphire are attributed with properties in addition to the general sapphire properties that are dependent on their color.